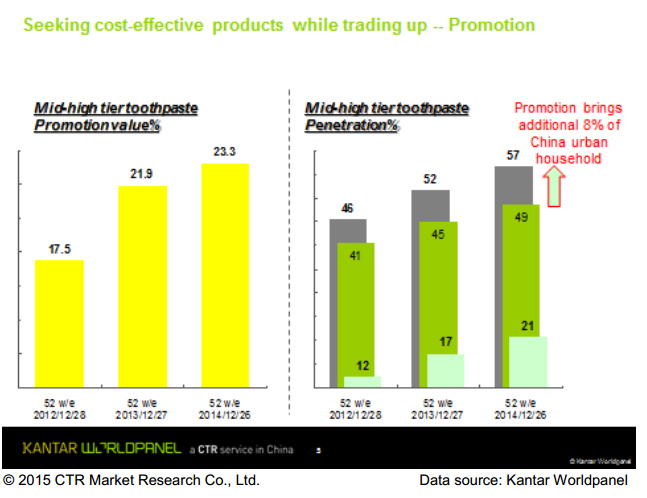 Kantar Worldpanel finds that, the procedure of trading up is step by step, firstly from Mass tier toothpaste (20RMB/100g). 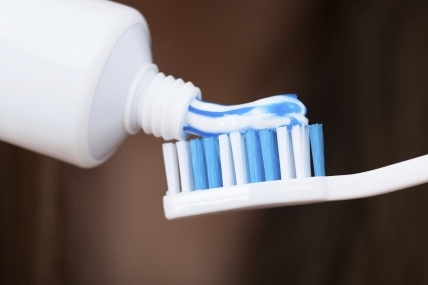 The study finds that consumers are purchasing less Mass tier toothpaste, with penetration rate drops from 2012’s 97% to 2014’s 95%, and the average purchase volume per household also drops from 1.23KG to 1.14KG (1.14KG roughly equals to 5-6 tubes of 200g toothpaste). Though Mass tier toothpaste declines, while it still owns the biggest buyer base and highest consumption level. Thus, for those manufactures who own both Mass tier and Premium tier products, it’s an opportunity but also quite challenging to keep trading up consumers. Nowadays, Mid-high tier toothpaste consumer group is expanding. Mid-high tier toothpaste penetration grows from 2012’s 45.6% to 2014’s 56.6%; average purchase volume per household also grows. As a result, the sales of Mid-high tier Toothpaste increases by 19.4% and becomes the key driver force of toothpaste market’s growth. For Super premium toothpaste (>20RMB/100g), it also keeps attracting new buyers. 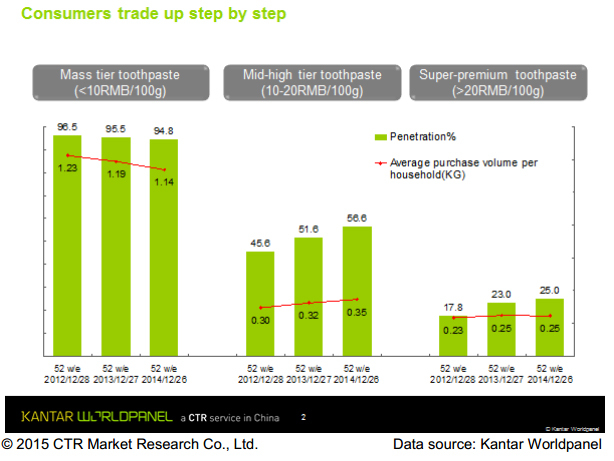 Kantar Worldpanel data shows that, although the buyer expansion is slowing down, around 1/4 of the China urban households purchased Super premium toothpaste in the past year, which is 7.3% higher than 2012. On the other hand, Super premium toothpaste is facing big challenge in recruiting new buyers. The key reasons are: First, it will be much harder for distributing the Super-premium toothpaste, or Super-premium toothpaste focus on special channel (e.g. dentist, pharmacy); second, the high price of Super-premium toothpaste becomes a higher barrier for trial purchase. However, Kantar Worldpanel also observes some of the Super-premium brands use one of its SKU (e.g. Sensodyne Freshmint) as an entry level product by offering a relatively lower price, which successfully attract new buyers and further convert to repeat or trade-up to higher price product. And another way is offering bundle pack to lower down the price, aiming at attracting more budget-conscious consumers as well as enhancing consumers’ loyalty. 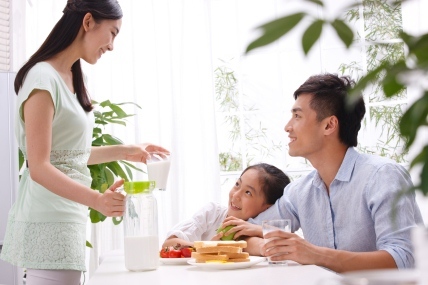 Nowadays, consumers’ needs become more various, and consumers are also more sophisticated. When consumers trade up (in toothpaste), they focus more on added-value benefit products, so as to meet daily life’s needs. Kantar Worldpanel finds that, the new products which have added-value benefit are easier to attract consumers. For example, Colgate 360’s added-value new product – 360 Professional Gum Care, contributes a lot to Colgate 360’s fast growth. Post launch for one year, 360 Professional Gum Care recruits 2.3% of China urban households, which is more than a double of the average toothpaste new launches level. Furthermore, 27% of them are Colgate’s new buyer, comparing to the similar price new toothpaste launches under similar size brand, this 27% of buyer incremental is rather remarkable. This finding is quite in line with Kantar Worldpanel’s studies in the past: premiumization couples with sophistication. The key for a brand’s growth is to keep attracting new buyers which brings incremental sales. 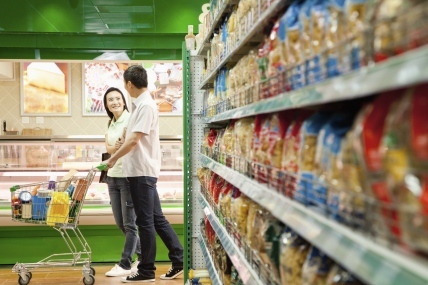 A long with the China economic slowdown, Chinese consumers are being more budget-conscious. Even when trading up in toothpaste, they keep looking for something value for money. Kantar Worldpanel finds that, lots of consumers purchase Mid-high tier and Super-premium toothpaste while they’re on promotion. In the past (2012), promotion accounted for 17% of the Mid-high tier toothpaste sales. This number grows to 23% in 2014, which helps to bring additional 8% of China urban household for Mid-high tier toothpaste. 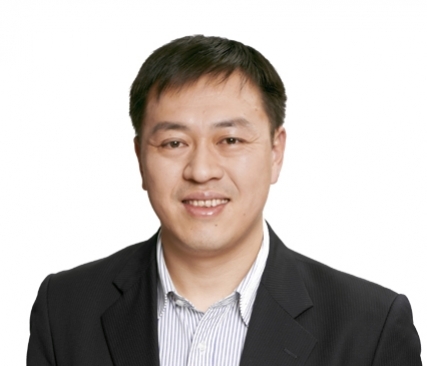 Couple with the mature of the online platform, payment system and logistics system, online sales is blooming in recent years. Consumers now not only purchase books and cloths via online system, but also purchase FMCG product via online to saving money for daily life. Therefore, toothpaste also grows dramatically in online channel, and the growth rate reaches 55% in 2014. Many toothpaste manufactures seize this opportunity, and step in online market. Comparing with brick-and-mortar, a same product’s price is usually 15% lower at online channel, some of the toothpaste products’ price are even 30-40% lower than offline channel. All of these tells that consumers gradually will purchase toothpaste product via online and seek for money saving. From the development of toothpaste market, we can tell that consumers keep premiumizing, while in a more rational way. Manufactures should give a good reason for consumers to trade up, and maintain sustainable development by understanding the needs of Chinese consumers.